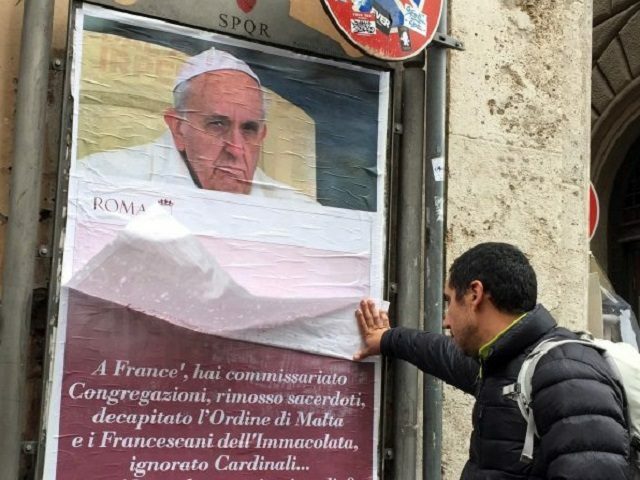 Romans woke up Saturday to find their city plastered with hundreds of posters criticizing Pope Francis’ heavy-handed governance of the Church. After making a name for himself as an open-minded, grandfatherly figure with an emphasis on mercy over doctrine, Pope Francis has undertaken a series of ostensibly harsh measures that have left many observers scratching their heads in perplexity. The posters that adorned the city of Rome Saturday bore an image of the pontiff along with a list of his alleged recent misuses of papal power, including ignoring cardinals, removing priests and “beheading” two Catholic organizations. 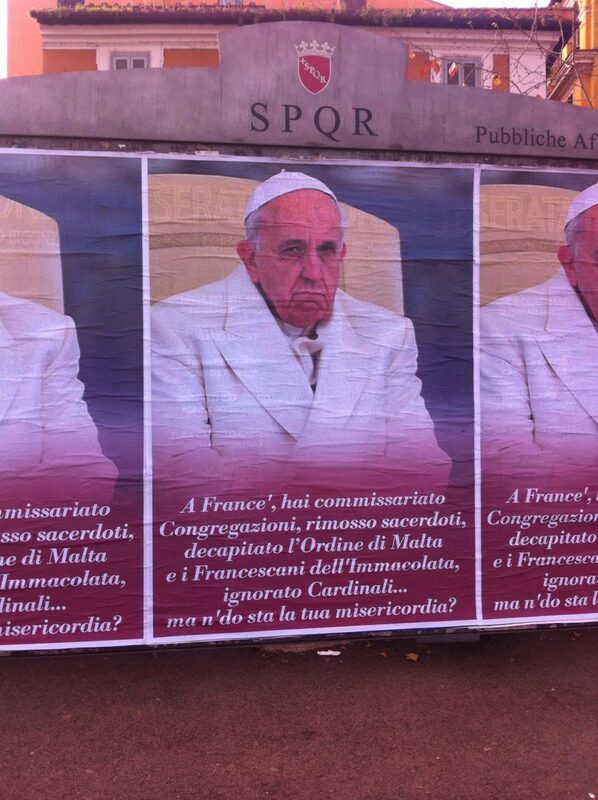 The posters follow a centuries-old tradition of Romans’ public, albeit anonymous, criticism of the Pope when he is seen to overstep his mandate. In past times, discontent Romans would attach their written complaints to an ancient, dilapidated statue called “il Pasquino” near Piazza Navona. Having placed great stress on mercy since the beginning of his pontificate, Francis has found himself particularly susceptible to the criticism of a certain double-standard, since he has reserved his most strident invectives for conservatives, labelling them rigid, doctrinaire and legalistic. 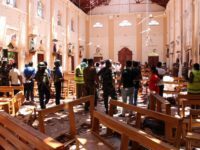 In recent times, he has increasingly passed from words to actions, including notoriously twice demoting conservative Cardinal Raymond Burke—the former head of the Church’s highest court—and firing Vatican clerics who allegedly criticized the Pope in private. The series of moves have led some critics to speak of an “ideological purge” being carried out by Pope Francis. In a recent article, veteran Catholic reporter Philip Lawler offered a partial list of the pontiff’s supposedly autocratic actions of the sort criticized by the Roman posters. Lawler also mentions the “abrupt dismissal of three clerics on the staff of the Congregation for the Doctrine of the Faith,” for which no explanation was given. According to reports, the Pope made a point of saying that he did not have to give an explanation for the sacking. In point of fact, the priests had been accused of making “unflattering comments about Pope Francis” in private conversations, leading to speculation of how Francis got wind of the remarks. Then there was the “contemptuous treatment” of the four cardinals who submitted questions (dubia) about a recent papal letter called Amoris Laetitia, which left many wondering how the Pope’s ambiguous teaching on Holy Communion for divorced and remarried Catholics squared with the traditional doctrine of the Church. Unlike his immediate predecessors, Pope Francis has also reserved important promotions to like-minded bishops, stacking the College of Cardinals with progressive newcomers while snubbing more senior prelates whose approach does not match his own. Criticizing the Pope apparently has an upside. While Roman public services are noteworthy for their inability to remove ubiquitous graffiti throughout the city, they were somehow able to remove all the posters criticizing the Pope before nightfall Saturday.